Never mind Sirius Minerals, Danakali Limited (LON:DNK) is set to become the world’s largest player in the potash field, broker Daniel Stewart said. In a research note entitled “Danakali Limited: Probably the best mine in the world”, the broker said the company’s 50 percent owned Colluli asset in Eritrea is “recognized as the world’s superlative potash deposit”. “With an estimated 200-year mine life, Colluli’s shallow nature (from 16m), will contribute to a lower capital development cost and lower operating cost, enabling Danakali to reduce investor risk by coming down the industry cost curve,” the broker said. The Colulli project is further de-risked by its relatively close proximity – 143 miles – to the Massawa port for shipping. This has attracted an off-take agreement with EuroChem Trading, a leading global producer of nitrogen, phosphate and potash fertilizers. Under the 10-year agreement, EuroChem Trading has the right to purchases no less than 87% of sulphate of potash (SOP) from the first phase of production (known as Module I). “As the world’s population marches to an estimated 9.8 billion people by 2050, and the availability of arable land decreases, potash will become a critically important commodity by virtue of its ability to increase both yield and crop quality in order to feed the world,” the broker said. 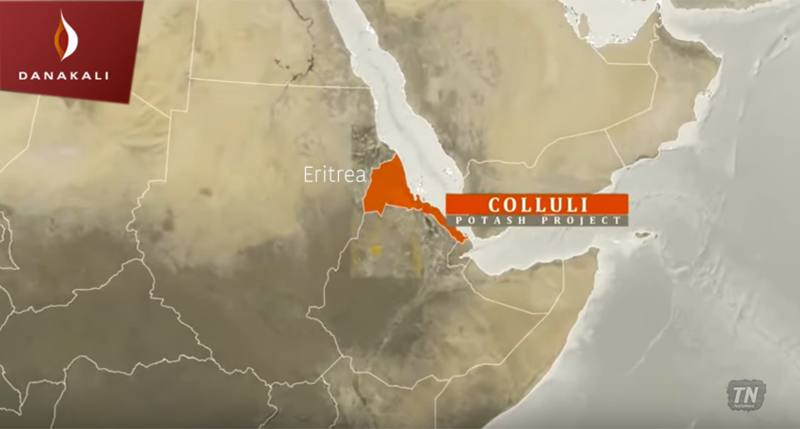 Colluli is not only the shallowest known potash deposit in the world but also the closest to coast – 75km from the Red Sea coast – providing unrivalled logistics advantage over the other potash development projects in the Danakil Depression.